Yamaha has always been famous for providing great quality at affordable prices, but most of all, for giving young, aspiring players a break when they most need it – at the beginning.The Yamaha JR1 is no exception. It’s a ¾ scale guitar, which makes it ideal for kids, people with dainty hands, and those who travel a lot, and need a trusty companion. As if the quality and price weren’t enough to convince people, Yamaha has thrown a complimentary gig bag into the deal. 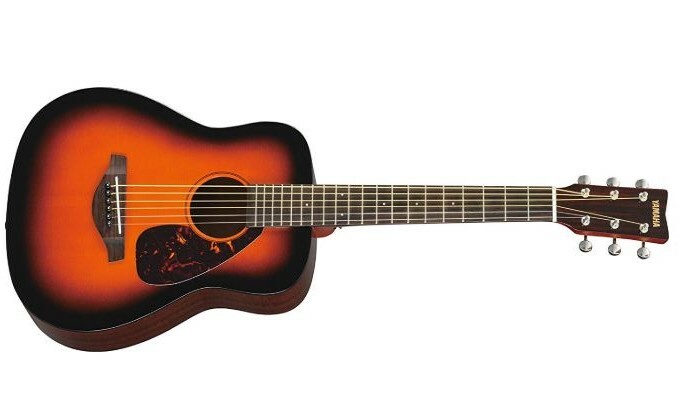 Yamaha also offers the JR2 model, another ¾ scale guitar which includes a UTF (Ultra Thin Finish) Mahogany finish. Additionally, a solid spruce top model is offered - the JR2S. Despite being a small-scale guitar, the Yamaha JR1 is built with the storied quality and playability of the FG dreadnought series. As a matter of fact, the JR1 sports that same iconic shape, though at a lesser scale. It was designed with kids and everyone who finds full-bodied guitars unwieldy in mind. The spruce top is ideal for a long-term investment, as it starts with a somewhat raw sound, but grows clearer and defined with age. As the top here is not solid, but laminated, it will also mean that it won’t be subject to weather conditions as a solid top would be.The back and sides are made of meranti, also known as “Filipino mahogany”. This type of wood shares many of the features attributed to mahogany, though mahogany is still considered superiour to meranti in terms of durability. The nato neck, backed (pun intended) by an adjustable truss rod, and a rosewood bridge and fretboard round off this section of the review. Keep in mind that despite the size, this is not a toy, but a fully functional guitar. With the combination as is, this puppy has a natural finish, which nicely rounds off the functional design. However, other models of the series will feature different finishes and different combinations of materials, so you can have a choice. The UTF (Ultra Thin Finish), only on the JR2 and JR2S models, has been added to enhance both beauty and durability. The action is adequate, with no buzz and not one dead fret. There’s some fiddling need done around the nut, but that’s negligible; however, if you think your child can’t handle the action, ask a professional to help you. As far as the feel goes, the fretboard is smooth and the frets well-dressed, so no problem there. While still producing the warm lows and a thick sound overall that a mahogany does, the meranti timber gives a little more volume than its counterpart. The spruce top has great dynamic response, and the body complements it nicely, bringing the brightness of spruce to warmer areas. It’s important to note that this guitar can’t compete with full-bodied guitar in terms of output. If you want a loud, boomy guitar, go for a standard dreadnought. If, on the other hand, you find the full-scale guitars to be bulky and uncomfortable, and would rather have something scaled-down, the Yamaha JR1 is your thing. Finally, take a listen to the Yamaha JR2 for comparison. Hope this helps you choose a guitar that you will enjoy.